b. The simple Mission-style buildings were inspired by the early Spanish mission churches in California. Exterior walls are usually covered with stucco, although oolitic limestone is also used. 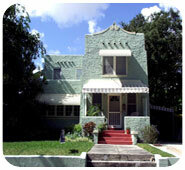 The most distinctive features of the style are tiled roofs and arches. Roofs are commonly low in pitch or flat, featuring curvilinear parapets or pent roof sections. The same parapet lines are often repeated over the front porch. Parapets may be topped with simple stucco molding, or with a single row of sloping Mission tiles. Cylindrical tiles, or scuppers, drain rainwater. Windows may be sash or casement type. Arches are typical on the facade and common on other openings. The front porch sometimes extends over the carport or garage entrance to one side of the main building mass. Applied decoration is kept to a minimum.